dice a large onion and sauté it in olive oil. Add two diced bell peppers (reserve some to sprinkle on top before serving) and three minced garlic cloves. When the vegetables are tender, add two cans of organic black beans and two cups of broth or stock. Next add one teaspoon of sea salt, one teaspoon of cumin, and one half a teaspoon of chili powder. Simmer until the flavors blend (and I used an immersion blender to thicken it a little). 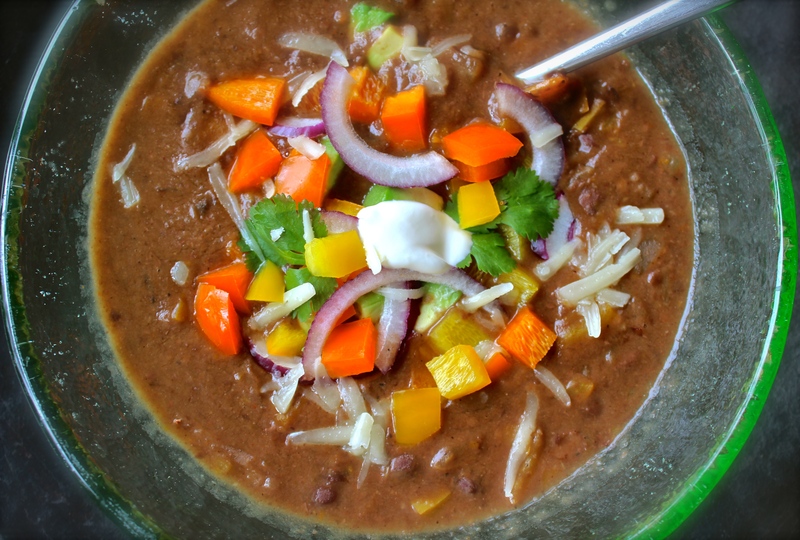 Serve the soup with your favorite toppings like avocado, peppers, onion, cheddar cheese, cilantro, and sour cream. On day 74 of this 365 day project, I ate my daily five (including avocado toast for breakfast). Did you enjoy yours?